handmade earrings by Rainbow Sugar // designer knock-off babydoll hoodie (purchased pre-trend, thank you very much! ), shrunken by me (#dryerfail) // oversized French designer cardigan (thanks Kate!) // extra-long sleeved tee // sweater dress // sweater leggings // leg warmers strategically covering my tiny ankles which would otherwise be accentuated by my supercomfy soccer-mom style Colombia sneakers. The two new-ish things are the Urban Expressions teal purse and the clear umbrella from Modern Love (thanks Richard!). 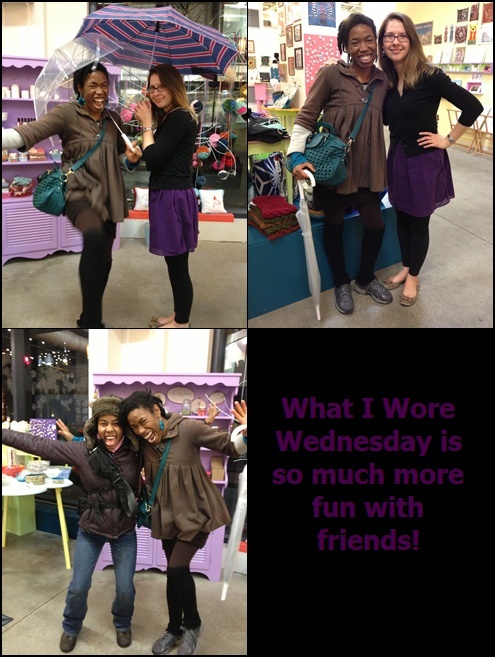 I am modeling in Craftland with my awesome co-worker Amy, in purple skirt and snazzy leopard print flats, and my fabulous friend ALF, in the cozy hat and deep plum jacket. I love these girls! They are my two best friends in Providence. Last week I didn't share what I wore on Wednesday because I was out of town and had no one to photograph me. I did snap this picture of myself in the tiny bathroom mirror. Looking at it again, I don't think it came out that bad. This outfit was practically free! I'm wearing: my ex-roommate's cast-away turtleneck (more teal!) // Patagonia sweater found in a free box in Prospect Heights // American Apparel skirt (thanks Liz!). I purchased the black leggings, grey knit knee high socks, white and blue stripped earrings, and the Afro wig. I love how the stripes in the earrings play off the stripes in the sweater. I also love blacks and greys paired with color. I could do without the big pockets on both the sweater and the skirt, but hey, when in Rome (or whereever you're vacationing), wear what you've got packed! Okay, I'll be back with more green cleaning content tomorrow. Hugs! Thanks so much for reading this blog entry! I hope it was entertaining. Please like Olivia Cleans Green on Facebook, join my email list, subscribe to my YouTube channel, follow me on Twitter, and subscribe to my blog posts (by RSS or email) to keep in touch and discover more creative green homemaking tips. I found your blog on The Pleated Poppy and I love your hair:) Cute outfit also! Have a good day! That purse is gorgeous, and absolutely my favorite color! Thanks Jennae! Teal is becoming my favorite color too! Me too! I photographed myself in the bathroom of the apartment where I cat sit. I love that color too. I'll have to find out what it's called. It's too fabulous to keep secret! OMG your hair is freaking beautiful! Love teal! Nice pops of color! You guys look so very happy in your pictures! I really like the stripes and the pockets on your sweater! We are happy! Thanks Rachel! Cute outfits and I'm not sure what Craftland is but it sounds like a place I want to visit! Thanks Tonia! Craftland is a shop that sells handmade goods (jewelry, stuffed animals, cards, some apparel & accessories, prints) by over 100 indie artist. It's such a fun place! I work there part time. You should come say hello if you are ever in Providence, RI.